And then, as usual, I found myself running behind, all because I’d been diverted by a very big, very inexpensive bag of only slightly soft tomatoes that I found in Granville Island Market that morning. Since I’d just been looking at the slow-roasted tomatoes recipe in Fine Cooking Magazine, it seemed like Fate had stepped in, and I’d better play my part. I can’t say I’m sorry, even though, as usual, I had to press you into service in the kitchen. Roasted tomatoes have been a revelation, and they just keep getting better and more useful as the months go by. Even on the first night, they showed some sign of what was ahead. I started out thinking of them as a relish for the smokies, but they looked and smelled so good that they crept into the puff pastry recipe too. At the time I thought they’d be seasonal, a use for over-ripe tomatoes in August and September. But it turns out that over-ripe tomatoes show up all year long. In the past, I stopped buying tomatoes in the winter, because they aren’t very good, and I don’t feel like eating them in cold weather. But now that I roast them, tomatoes in winter are a whole different food. Whenever I see soft ones, deeply discounted, I stock up. Like you, I’ve stopped using the cup of olive oil, and I love your tip about pressing the liquid out halfway through cooking to redistribute it in the pan. So now I’m using your roast tomato recipe. Funny how that works. 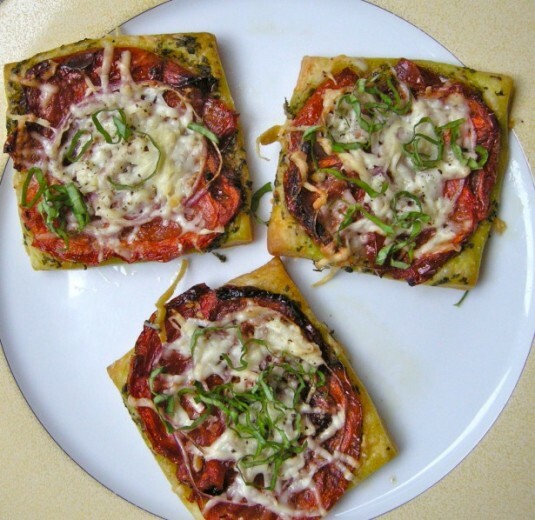 Here’s the recipe for the puff pastry appetizer, with a few changes from John Bishop’s recipe: baked tomatoes instead of the romas he calls for, and basil pesto instead of olive oil and chopped fresh basil. On a lightly floured surface, roll out puff pastry to form an eight-inch square, 1/8th of an inch thick. Cut into four four-inch squares. Prick pastry all over with a fork and refrigerate for 20 minutes. Peel onion and slice as thinly as possible, preferably with a mandolin. Brush pastry squares with pesto. Press any extra liquid out of baked tomatoes. 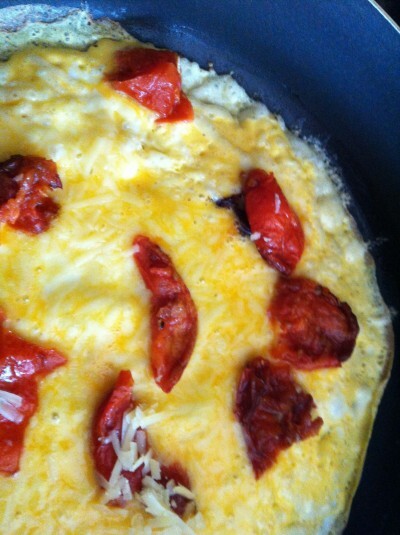 Arrange tomatoes in a layer. 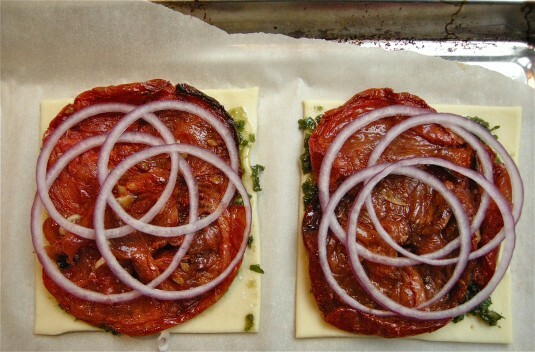 Place a layer of onion slices over the baked tomatoes and top with grated Asiago cheese. Drizzle with olive oil and sprinkle with a grinding of black pepper. Place on the prepared baking sheet and bake until pastry is puffed and golden, about 15 minutes. To serve, place each tart on a warmed plate and garnish with basil threads. By the way, thanks for the tip on refreezing puff pastry. I bought a one-pound package from Whole Foods, and only used half when I last made the Warm tomato and Asiago Tart. But I rolled it all out, and cut it into squares. I froze the extra on a cookie sheet and then slipped them into a freezer bag. This is dangerous knowledge – I’ve already whipped up a quick mango puff-pastry tart, just because I had a mango, and with the puff pastry all ready in the freezer I knew it would take no time at all. 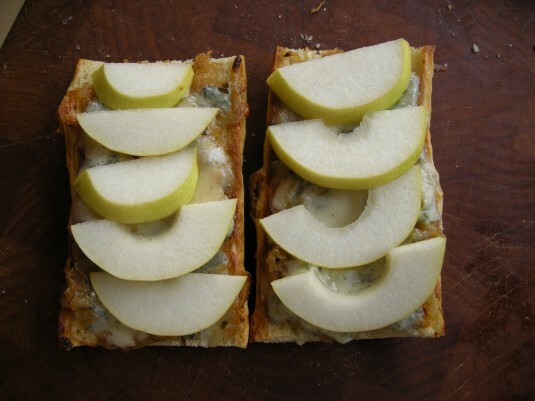 Gorgonzola and Caramelized Onions with Pear: Big or Small? Here’s the recipe for the appetizer I brought to Thanksgiving dinner. 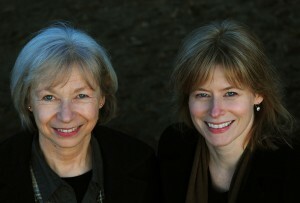 I’ve made it twice since then, each time to rave reviews. I’m always on the lookout for party food that has substantial protein – something to sop up the alcohol. Not only is this one fast and easy, at least once the caramelized onions are made, you can make it ahead, and just do the baking and topping with pears at the end. This makes 24 pieces, which should easily serve eight. The original recipe called for rosemary, but I used variegated oregano, because what’s on my back deck and still green. With two pounds of onions, I ended up with 2/3 of a cup left over. I know I should change that quantity to a pound and a half, but leftover caramelized onions are such a bonus I can’t bear to do it. Gorgonzola Dolce is milder, sweeter and much softer than regular gorgonzola. Heat the oil in a skillet over medium-high heat. Add the onion and brown, turning frequently. When it begins to soften, season generously with salt and pepper; reduce heat to medium. Continue cooking for about 15 minutes, until nicely caramelized. Add the rosemary and transfer to a bowl to cool to room temperature. Heat the oven to 400 degrees. Put the bread in the toaster until lightly browned, then lay the slices on a baking sheet. Spread about an ounce of Gorgonzola on each toast, then top with a tablespoon of the onion mixture. Bake on the top shelf of the oven until bubbling and lightly browned, 5 to 7 minutes. While the crostini bake, halve the pears, take out the cores - preferably with a melon baller - and slice horizontally into thin slices. 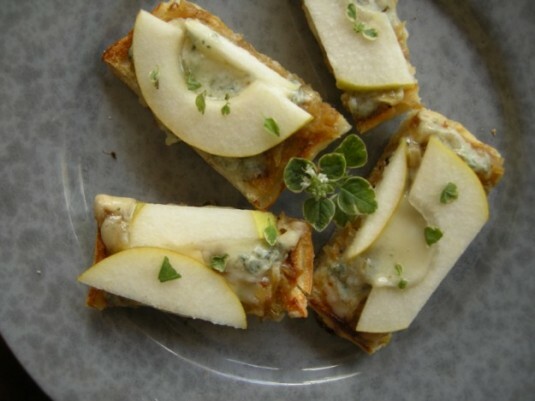 Top the crostini with pear slices, then cut each one into three pieces. Serve immediately. So here’s the question: remember I came with the caramelized onions and gorgonzola already spread on the toasted baguette? I’d made the sections of baguette big enough that once they were baked and topped with pears, I could cut them into smaller pieces, maybe four per slice, because it was faster. You said you’d have made mini ones – citing your well-known love of tiny food. Want to mess with the recipe? What do you think would be the optimum bread? How would you rewrite the recipe for a mini-mini crostini?